Like most football fans across the world, I have taken a perverse and personal delight in watching the bloated, jowly patriarchs of FIFA fall, one after another. Not only do I feel that the on-going investigations into the misogynistic world of backslapping, ham-handed, wink-wink deal making are confirming my own knowledge and intuition, but also that the doors to the smoky back rooms of FIFA have been prised open, exposing a global coterie of sycophants and their clever, intertwined, and illegal schemes. 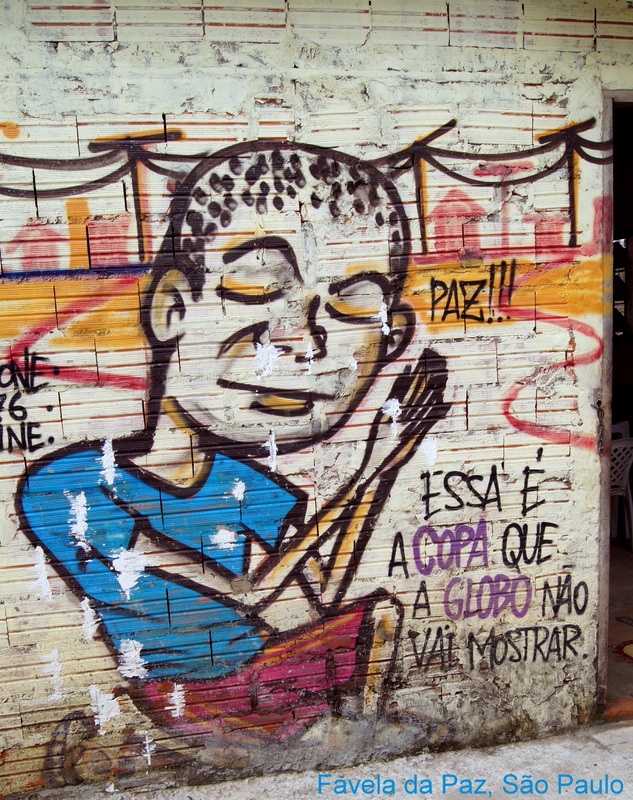 For the last six years, I have been investigating how the hosting of the World Cup and Olympics impacts upon urban and social relations in Brazil. In this work, I have exposed how the intricate shell game of FIFA and the IOC extracts maximum wealth from host cities and countries while at the same time militarizing and privatizing urban space, violating human rights, and leaving legacies of debt and unfulfilled promises. For those who can afford it, the party is fantastic. Once the floodlights have burned out, the hangover lasts for decades. 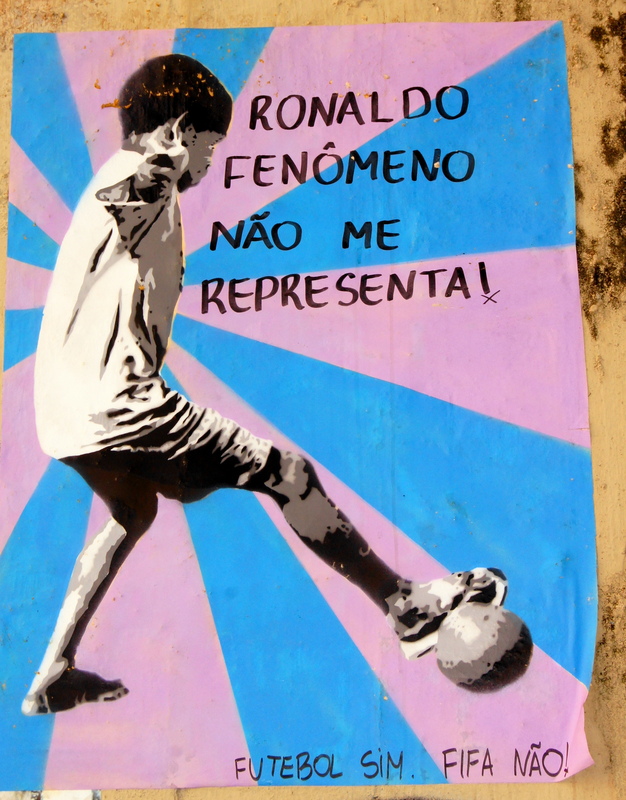 In Brazil, the links between big business, big government, and big sport are opaque and insidious, yet the connections to the most recent FIFA-crisis are all too clear. 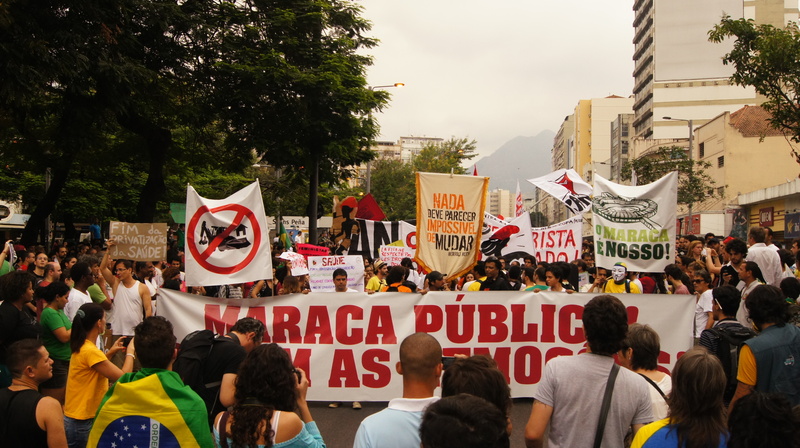 Brazilian companies and executives are in the spotlight, again, for all the wrong reasons. will there be anything left of FIFA? Or rather, is it reasonable to think that FIFA can disassociate from the same kinds of oppression, violence, and injustice that define global consumer capitalism? Predictably, it was from FIFA´s band of servile minions – morbid troglodytes like Chuck Blazer, hyperbolic shysters like Jack Warner, and half-arsed opportunists like Ricardo Texeira – that the tightly wound FIFA-world began to unravel. Too much money flowing too quickly to the wrong people though the wrong country for too long, coupled with the FBI´s charming insouciance for the real-politik of global sporting affairs has resulted in a very hard, very determined tug on a lot of rotten strings. Among the unanswerable questions is, if it all unravels, will there be anything left of FIFA? Or rather, is it reasonable to think that FIFA can disassociate from the same kinds of oppression, violence, and injustice that define global consumer capitalism? There has never been a period in the era of mass-communications when FIFA was not corrupt, so how will it suddenly emerge? Will cutting off some heads of the scabrous FIFA-Hydra change the nature of the beast? 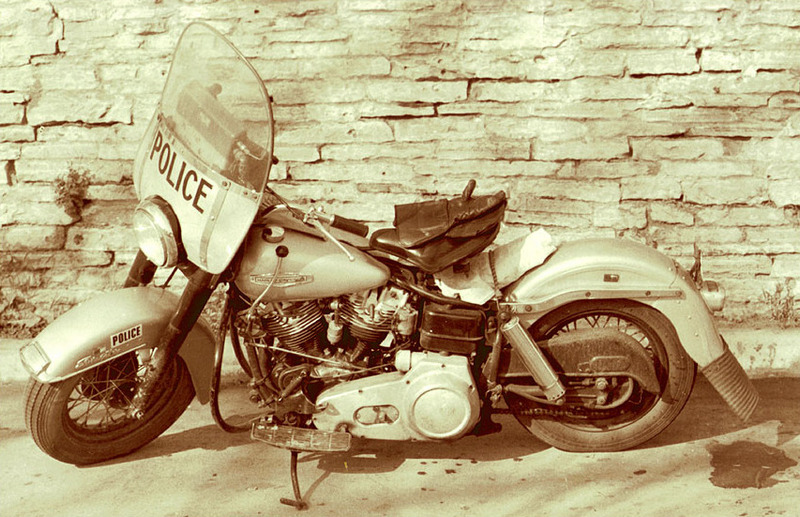 While behind the scenes deals are being struck, these desperate attempts to consolidate power are finally in conflict with an exasperated public, the FBI, and a thirsty press corps. Somehow, despite the rot, we are still captivated by football. FIFA paid the Irish FA 5 million Euros to not make noise about being wrongly disqualified from the 2010 WC. This list is far from comprehensive and spans several modes of corruption, ones that affect governance, publicity, as well as actual decisions on the field. One hopes that in the coming months, the details will emerge to fill in these categories. In the meantime, everything – from marketing contracts to penalty decisions to hotel accommodations – is tainted with corruption. Journalists and academics that report on and research global sport had yet to touch the bottom of the fetid pool, but even for us it still comes as somewhat of a surprise that the rest of the world can now read about match-fixing, illegal transfers, human trafficking, money laundering, Swiss bank accounts, bribery, racketeering, falsification of contracts, etc. as an integral part of the way football is organized. With the recent politicization of labour rights for NCAA athletes, the banal cruelty of playing a World Cup on turf, and the destruction of human life in the NFL and its subsidiaries, perhaps there is a chance that sport and politics will find a place in the public consciousness. In reality, the FIFA saga is a captivatingly complex morality play being acted out on a global stage with curious twist: the chorus is hundreds of millions strong and may be able to influence the plot. Will the hood-eyed prince, Michel Platini, make his move for the presidency now? Will the court jester, Zico, show that he can perform better than Texeira? This is not about using sport as a force for good, or as FIFA claims “developing football everywhere.” Sport is about power and we should be aware that our places in the audience impact on its exercise. We know World Cup games are bought and sold. We know that the WWC is being played on turf because football associations are on FIFA´s leash and have more power than the players. 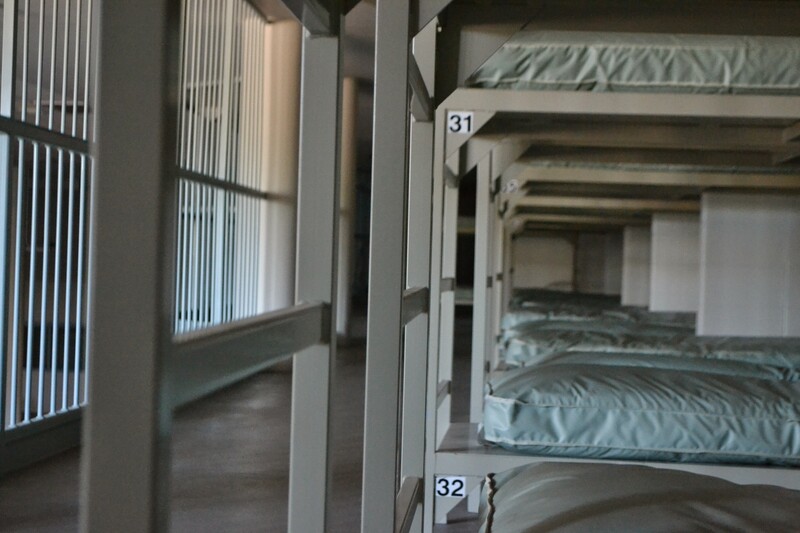 We know that thousands of kids are trafficked across borders, sold into prostitution, or are molested, mistreated, or die because of a lack of medical attention. For every Dani Alves or Neymar, there are a hundred thousand broken legs and a million broken dreams in Brazil alone. We know of the bribery behind World Cup bids, the illegal and blindingly idiotic stadium building contracts, the militarization of cities for FIFA VIPs, dirty billion dollar television contracts, institutionalized racism and sexism, and a never-ending series of lies, deceptions, and platitudes. There is no “Fair Play” in or with FIFA. As a reminder of how short our memories are, it is nearly a year to the day that the 2014 World Cup kicked off in Brazil. Of the twelve stadiums, in the twelve cities, ten are in serious difficulty. The only two that are not going through financial and political turmoil are the two built by clubs in Curitiba and Porto Alegre. Of all the football associations implicated in the current FIFA hullabaloo, the Brazilian federation is the most embroiled. The Brazilian João Havelange was FIFA´s modern architect and his granddaughter, an executive director of the 2014 World Cup, famously quipped about the R$ 30 billion outlay, “however much was spent, or stolen, already has been” [so why worry?]. 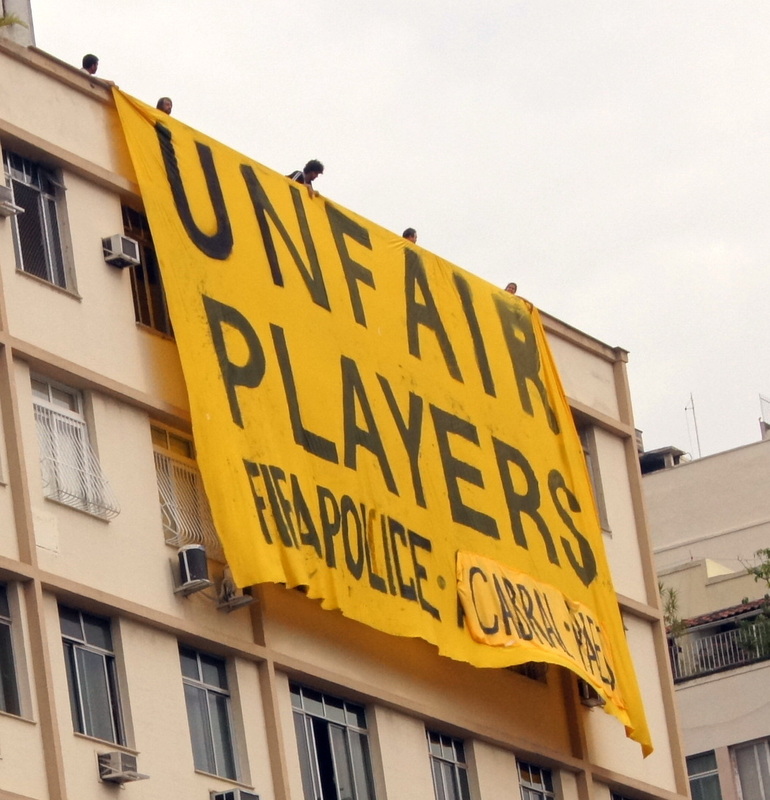 None of the “legacy” promises made by FIFA has come to fruition in Brazil. 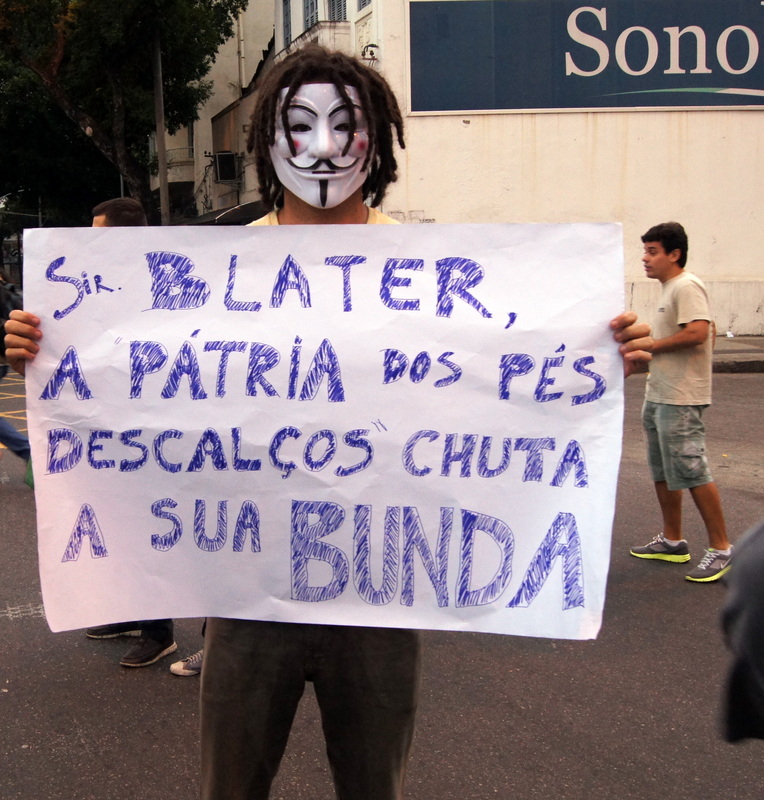 On fleeing the country as protests erupted around the Confederations´ Cup in 2013, Blatter announced a $ 100 million USD “legacy fund”, that would be administered by the CBF. This is the Brazilian organization recently run by a man now sitting in a Zurich jail house and currently headed up by a man who fled Zurich and ran straight to Brasilia where he was honoured by senators and congressmen. Of course, FIFA regulations prevent the Brazilian government from interfering in CBF affairs, a position that is at least consistent with the surrendering of territorial sovereignty that comes with hosting the World Cup. This takes the form of tax exemptions, restrictions on advertising, and the ability to close any street in a host city, at any time, for any reason. And now, as if to prove the point that the Canadian World Cup doesn´t matter, the Copa America kicks off in Chile, a country with long and painful associations between football and politics. In the same way we should remember those tortured and murdered in Santiago´s National Stadium, we should also remember that the same people who organized, broadcast, and advertise at this tournament are implicated in the shambolic governance of football. The show goes on with the same delirious media coverage, the same lack of critical reflection, the same people making more money than ever. It may be that FIFA and football are beyond reform as long as the crowds pour their money in and conform to FIFA´s inexhaustible list of prohibited behaviours. Is it possible that the global chorus of football fans can only hope to sing their teams on to victory, while the dark-suited protagonists squirrel away their millions? Can anything change if we only watch the ball? Christopher Gaffney, PhD (University of Texas at Austin) is a Senior Research Fellow in the Department of Geography at the University of Zurich. His work investigates the impact of major sporting events on urban centers and their populations. We would like to welcome Ben Penglase in this latest edition of our monthly feature, Tip of the Cap. 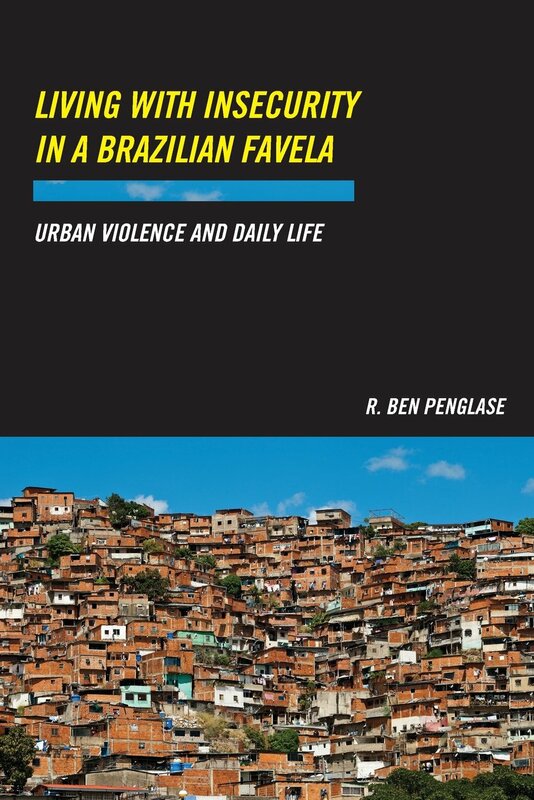 My book, Living with Insecurity in a Brazilian Favela, examines the social production of insecurity in a poor neighborhood in Rio de Janeiro, paying particular attention to how multiple, overlapping forms of urban violence impact the residents of a neighborhood that I call Caxambu. I try to show how the neighborhood is experienced as a profoundly contradictory space. On the one hand, it is a place of social intimacy, pride, and creativity, reflecting the deep social ties that bind many of its residents and the years of work that they’ve put into building their homes, streets and alleys. Yet at the same time it is often a space of social marginalization and unpredictably lethal violence, reflecting how drug-trafficking and policing conspire to disorganize daily life.